The leader of Cornwall County Council David Whalley is standing down as a councillor, complaining of personal attacks against him. Mr Whalley made the decision just weeks before the start of a new "super-council" which will unite district councils and the county council. He has overseen a range of issues including the Newquay Airport row and cuts to social care funding. And he accepted personal attacks were partly behind his decision to quit. The Audit Commission told the council earlier this month it was not making adequate improvements to the services it provides. Liberal Democrat Mr Whalley has also fought off a number of votes of no confidence. He has faced heated debates on issues such as Newquay Airport, which was forced to close for three weeks in 2008 in a licensing wrangle. 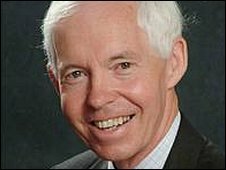 Mr Whalley, 65, who was elected leader in May 2005, told BBC News that he would be standing down on 4 June when elections take place for the new unitary authority, One Cornwall. He said: "One of the negatives of politics is that it does get very personal." Former head teacher Mr Whalley said he could not have coped without the support of his wife, Val. He said: "If affects the family more than the individual, when they see things like calls for resignation and people being personal about me, they take it personally themselves. "When I see abuse of politicians, locally and nationally, I think it is unacceptable." One Cornwall starts operations on 1 April. "I agonised over whether I should stand for the new council," he said. "I've been involved with politics for 30-odd years and decided it is time to step aside for a younger person." He added: "I think we have improved things a great deal and the fruits of that will be shown over the next three or four years." Key council services are "weak"